Our first wedding cake of 2018! Huge congratulations to Lauren and Dan who were married at the beautiful Leez Priory, Great Leighs, Chelmsford. We love it when couples come to us when we’ve been recommended to them by a former couple and in this case Lauren and Dan were recommended to us by Lauren’s Sister who’s wedding cake we made back in 2016 which was lovely. 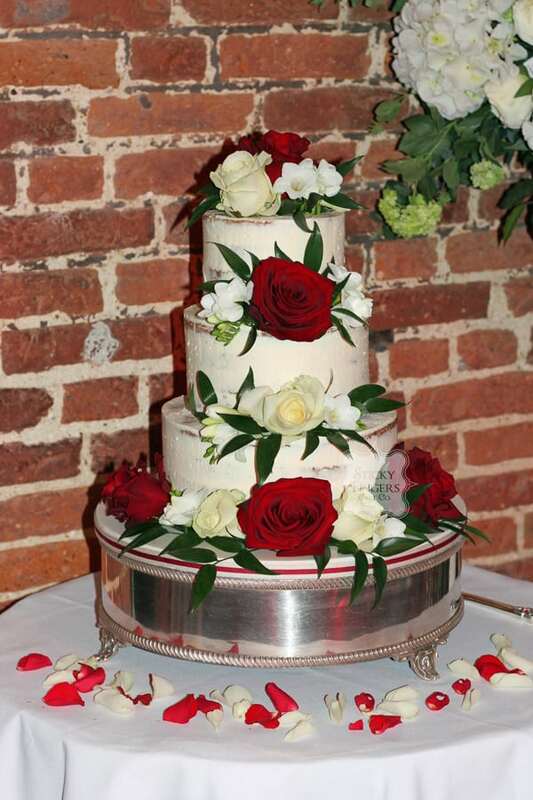 The happy couple had a three tier semi naked wedding cake which was decorated with red and ivory roses, in keeping with the time of year – Valentine’s Day being the week before. The yummy flavour they chose was Strawberry and Champagne for all three tiers plus a Salted Caramel cutting cake to be served alongside the main cake. I have to say, the cake looked wonderful against the backdrop of the brick walls of Leez Priory, it really is an amazing venue! Wishing Lauren and Dan and lifetime of happiness together!